This is an exciting time for Today's Dietitian! Just seven weeks ago we kicked off our 5th annual Spring Symposium with a bang in Austin, Texas, the city known for its live music scene, unique cultural heritage, hearty cuisine, and the largest bat colony in North America. Our Spring Symposium was our largest and most successful to date. Last year, I predicted that it would only get bigger and better, and it has—more than 700 attendees from across the country and abroad journeyed to Texas. Among the highlights, TD's very own Sharon Palmer, RDN, hosted another well-attended Food and Farm Tour. In addition, 24 highly acclaimed dietitians presented on various topics such as clinical dietetics, social media, ethics, communications, digestive health, branding, nutrition and culinary trends, hunger, agriculture, and self-publishing. Many of the RDs I spoke with said the continuing education sessions were practical, trending, and most relevant to everyday practice. It was great seeing many of the RDs with whom I've developed relationships over the past seven years and meeting others whom I've just begun working with. One of my favorite sessions was "Transforming the Mindset of Hunger to Better Serve the Underserved" by first-time presenter Clancy Cash Harrison, MS, RDN, FAND. With great passion, Harrison discussed the prevalence of hunger in America, presented creative solutions, and emphasized how important it is for dietitians to distinguish patients at risk of food insecurity and malnutrition. Other first-time presenters included Marisa Moore, Mary Litchford, Keri Gans (whom we recently featured in our Get to Know department), and Joan Salge Blake, whom I've interviewed several times throughout my journalism career and finally had the pleasure of meeting face to face. Noteworthy and exciting special events added additional flavor to the event. There were a variety of simultaneous lunch presentations, a yoga class led by Mandy Unanski Enright, MS, RDN, RYT, a reception during the exhibit hall grand opening, a bat-watching dinner cruise, and a keynote address by Trace Sheehan, writer and producer of the film Food Evolution, who dispelled many myths about GMOs. You can read much more about the symposium and view the photo gallery that captures the spirit of the event on page 40. 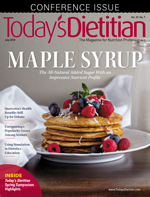 In addition, delve into features about maple syrup, exergaming, quercetin, plant-based diets and the microbiota, and simulation in dietetics education.